EA’s history on the PC platform dates back to the very first game in the NBA Playoffs series, Lakers vs Celtics. The forerunner to NBA Live didn’t always come out on PC though, nor was every instalment in the series a multi-platform release. While Bulls vs Lakers, Bulls vs Blazers, and NBA Showdown were released for both the Super Nintendo and SEGA Genesis, Team USA Basketball was a Genesis exclusive. With the re-brand and relaunch as the NBA Live series in 1994, EA Sports finally brought their sim-oriented basketball experience back to the PC. NBA Live 95 PC came out in March 1995, and it was a noticeable upgrade over its console brethren. While the graphics were still quite similar – this was before 3D acceleration, after all – the PC version did feature a high-res mode that was noticeably crisper. Being a CD-ROM release, it included media that was impossible to compress onto cartridges, such as high resolution player portraits, audio clips, and a full motion video intro. Not only were the menus more aesthetically pleasing, they were also much easier to navigate with a mouse. The PC version also included updated 1995 season rosters, instead of final 1994 season rosters like the console versions. Roster editing was also added and every player was now tradeable, rather than just the starters during season mode. 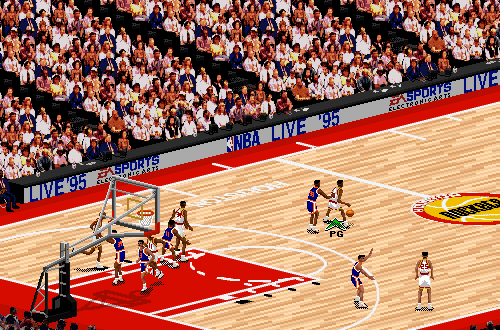 These enhancements made the PC version of NBA Live 95 superior to the consoles in several ways, though aspects such as gameplay and simulation logic were essentially the same. In fact, gameplay in the PC version did have one distinct disadvantage in comparison to the consoles, as despite the presence of multi-button PC gamepads – and a whole keyboard to work with – there was no steal button. Steals were attempted automatically by positioning your defender close to the ballhandler, at which point they began swiping at the ball. Needless to say, the attempts weren’t always well-timed, and it was rather easy to pick up cheap reach-in fouls. Strangely, this approach to stealing mechanics remained in NBA Live 96 and NBA Live 97, with expanded controls finally hitting the PC version in NBA Live 98. In most other aspects however, the PC release was well ahead of the console versions, with more detailed graphics, better roster management tools, and in some cases, extra features and modes of play. To compensate, certain console releases included an exclusive mode such as the Expansion Draft in NBA Live 96, or shootaround and other mini-games in NBA Live 97, but generally speaking they weren’t missed too much on PC. Once full controls were implemented in NBA Live 98, it was no contest. Official patches were another area where the PC version had a clear advantage. These days, developers can push through fixes and new content on all the major platforms. A few generations ago, that simply wasn’t feasible with most consoles, as even those that had online capabilities didn’t have a hard drive to store any updated files. Patches were therefore exclusive to NBA Live PC, a benefit that was particularly noticeable in NBA Live 99, which launched without updated rosters and the Class of 1998 rookies due to the lockout. The official patches not only addressed technical and gameplay issues, but added that content as well. The consoles versions weren’t so lucky. One of the biggest advantages of NBA Live on PC – just as it is today with NBA 2K – was the ability to mod the game. While emulation has made it possible to create mods for old console games, modding has traditionally been a PC-only perk. Certainly, no other platform has offered the same amount of depth when it comes to modding. In the early days of NBA Live modding, we relied on the tools that Tim, Lutz, and Brien created, from roster editors to EAGraph. When the series adopted the DBF format for save files, they went on to develop Microsoft Access modules that made editing the databases much simpler. Without those tools, we probably wouldn’t be here today. For their part, EA Sports subtly helped us out with our modding efforts. While there were no official tools, the PC version became increasingly modder-friendly over the years. Among the most important changes were the switch to DBF files, making it easier to edit rosters, and the introduction of CustomArt, which provided a much simpler way to replace art assets. When CustomArt made its debut in NBA Live 2003, EA even furnished us with a guide to the files and folder structure. Although the CustomArt method did change slightly in later releases, the ability to dump modified files in a specified folder remained in the game through NBA Live 08. 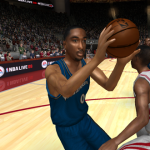 The NBA Live modding community remained strong through the early to mid 2000s, not only because of all that could be done with the games, but due to the generally positive reception to most of them. We enjoyed both playing and modding those titles, which was reflected by the amount of activity in the Forum during that era. By that point, the game was being ported from the consoles, which had more or less caught up in terms of graphics and features. Modding still set the PC version apart though, especially as we developed methods of adding higher resolution textures. 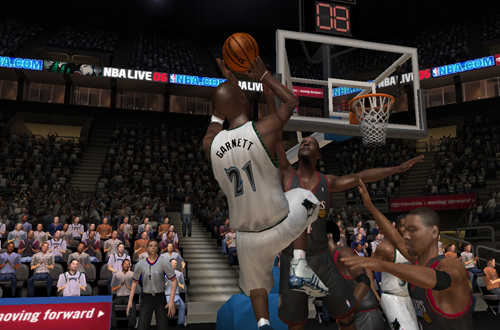 In my view, NBA Live 06 PC is the last great all-around game in the series, at least to date. NBA Live’s overall downfall can be traced back to mistakes that were made with the Xbox 360 version of NBA Live 06, but the end of the game’s run on PC was actually foreshadowed a few years earlier with NBA Live 2002. In terms of EA’s basketball game lineage, it was the first title since NBA Showdown to be a console-exclusive. Even though the series returned to PC the very next year, there was a perpetual fear that EA would pull the plug on the platform once again. Unfortunately, that came to pass in 2008. I still remember the disappointment I felt when the then-community manager for NBA Live reached out to me to confirm the PC version was cancelled. Although it was disappointing, it was not altogether surprising. NBA Live 07 and NBA Live 08 had not been good releases, on PC or PlayStation 2. They were clearly an afterthought, with the focus understandably shifting to the more popular platforms of the time: the PlayStation 3 and Xbox 360. 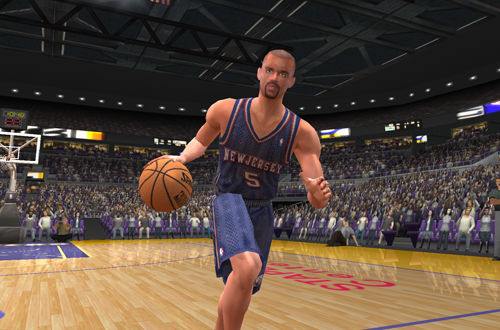 The PC version of NBA Live 07 only received one patch that addressed a very small list of issues. NBA Live 08, a game desperately in need of some official fixes, didn’t receive a single one. With the PC version selling fewer copies to a niche portion of the fanbase – a platform where piracy was rampant, no less – its fate was sadly sealed. The PC vs Console debate is contentious, and as someone who enjoys games on both, rather silly. While high-end PCs can support superior graphics on maximum settings, in terms of features and gameplay, today’s games are identical across all platforms. Modding still tends to set the PC apart in terms of creating new experiences or adding missing content, so it’s fair to say that as NBA Live continues to make a comeback, many of us would like to see a PC release again some day. While I’m not optimistic about it happening in the immediate future, if the series can get back to a point where it’s commercially and critically successful, it may indeed be a possibility. We’ll keep pushing for a PC version, but looking back at the older releases, NBA Live does have a solid legacy on the platform. For many years, the extra capabilities that it offered over the consoles set it apart as the definitive version, especially once 3D acceleration and a full control scheme came into the mix. It’s a testament to those games that to this day, we still have a few people playing and making great updates for a handful of old favourites. The enduring legacy of NBA Live’s PC releases is that they spawned a talented and enthusiastic community of gamers and content creators, providing a passionate portion of the fanbase with many fantastic memories.